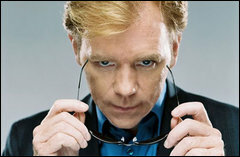 The man the legend Horatio Caine, protector of the innocent, master of all things ridiculous! Born in 1957, Caine’s parents named him after author Horatio Alger. Before he moved to Miami, Caine worked in New York City as detective with the NYPD. It was there that he killed the man who murdered his mother: his own father. In 1995, while on the job, he was stabbed while investigating a case in which children were locked in closets while their parents were murdered. Never fully address people by looking them in the eye, you’re too cool for that. Have a dramatic pause in your speech.